Our Blu-ray Thursday segment features Halloween films, John Carpenter films, zombie movies, and other Shout! Factory collectors editions. Our list of best apocalypse movie endings, where it’s total destruction. Sometimes it ends in a real apocalypse, sometimes not. New red-band trailer out for V/H/S/ 2 – the sequel to last year’s horror anthology V/H/S. With info and release dates. We take a look at Dark Corners (with Thora Birch), Head Trauma (indie), and Nightwish (bizarre horror from 1990). Carpenter’s sci-fi satire They Live follows Roddy Piper and Keith David as they discover evil alien capitalists running the planet. A look at Ridley Scott’s new sci-fi horror Prometheus (2012) which revisits the universe of the Alien movies. 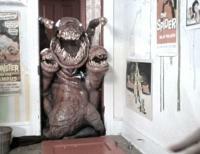 The Deadly Spawn is a funny 80s monster flick and cult favorite delivered on a limited budget. A look at The Thing 2011, the prequel/remake of John Carpenter’s 1982 film. Stars Mary Elizabeth Winstead. New horror movies – 2012 – brings sequels, remakes, apocalyptic thrillers, supernatural ghost stories, an Alien prequel, and World War Z.